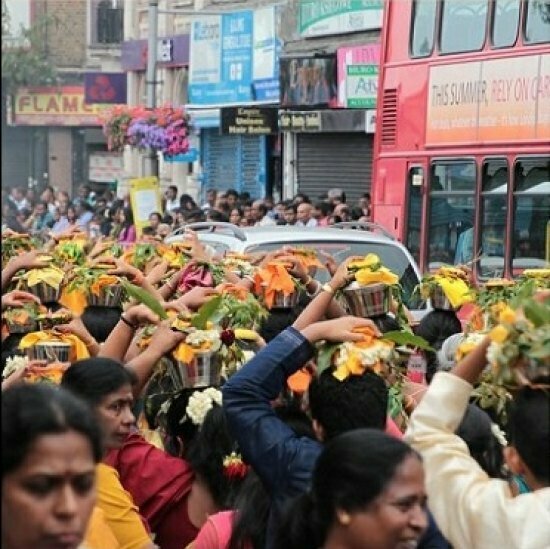 Thousands of Hindu devotees from Sri Lanka and India participated in the chariot procession for annual Thaipusam Festival organised by West Ealing’s Shri Kanagathurkkai Amman Temple on Sunday, August 14th. Devotees rolled bare on Uxbridge road (shayana pradakshanam), carried pots of milk on heads and pierced spears (vel) around mouths to pay tribute to Lord Murugan. Thaipusam festival marks the victory of legendary Lord Muguran against demon Soorapadam. The festival honours Murugan and his Vel – divine spear he used for the war against Soorapadam. The West Ealing Chariot Procession near Amman Temple saw devotees dressed traditionally. Some women carried auspicious pots of milk decorated with garlands, turmeric and holy leaves while some men rolled bare on the tarmac to pay their respects to the deity. Some other men pierced their mouths with sharp spears to pay tribute to Lord Murugan’s Vel. The event also included carrying deities on decorated carts and music using traditional Indian instruments such as Nadaswaram.